Happy Saturday! I know I rarely post on Saturdays, but today is a special Saturday. Today is my first Crazy Cooking Challenge! What is the Crazy Cooking Challenge (CCC)? It is an event started by Tina of Mom’s Crazy Cooking that showcases recipes from other blogs. Well, that used to be the case. Apparently this is the first challenge where you can use any source for your recipe, but before it used to be from blogs only. I saw a bunch of friends posting smoothies last month, so I wanted to join this month. Figures my first theme is Fried Chicken, something I don’t do too often because one – it is cooking and two – frying is a pain. I hate cleaning up the oil, which is probably good because that means I rarely deep fry. 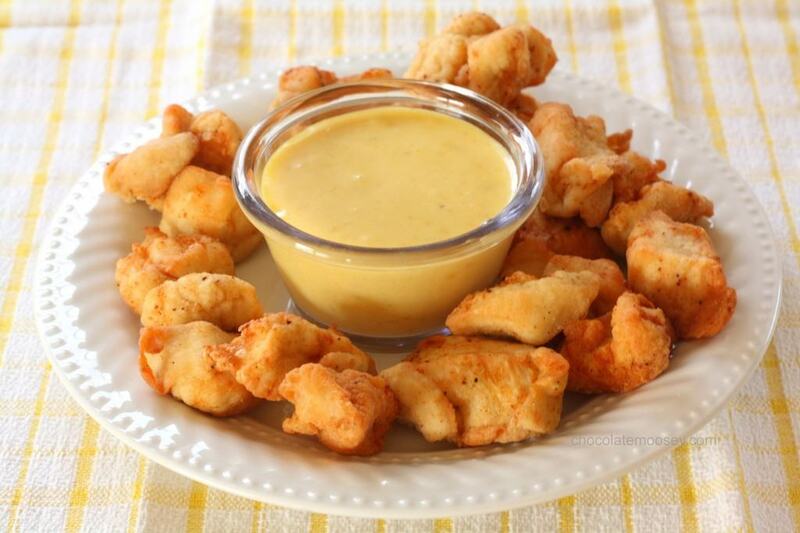 For the event, I fried some CopyCat Chick-Fil-A Nuggets with Honey Mustard Dipping Sauce – crispy chicken nugget bites that you dip into addicting honey mustard sauce. You haven’t lived until you’ve eaten at Chick-Fil-A. When I worked at the mall years ago, I ate Chick-Fil-A. A lot. If I opened, I got hash browns. If I closed, I got waffle fries and a sandwich for break. Sometimes I even got lemonade just because. However, they have this habit of closing on Sundays. We mall employees also had a habit of forgetting it was Sunday. I remember one day in particular, my manager and I really wanted Chick-Fil-A for lunch. Without thinking, I walked all the way down to the food court, our orders in hand, and when I turned the corner, I spotted those metal bars pulled over the counter. Major disappointment. I didn’t even have my phone on me, so I had to walk all the way back to the store to tell my manager and walk all the way back down with a new lunch order. Fast forward to a few months ago when I saw a very curious tweet from Julie of Table for Two about her Copycat Chick-Fuh-Lay Nuggets. See, it’s not just chicken nuggets. It’s Chick-Fil-A chicken nuggets. If you’re never had them before, there is a difference. They are better, more addicting. Julie’s secret ingredient is powdered sugar. Powdered sugar? With chicken? Crazy but it’s what makes these chicken nuggets addicting. I made some adjustments to her recipe by adding some onion and garlic powder to both the breading and the dipping sauce, but for the most part I stuck to the recipe, frying and all. When I noticed her recipe called for 6(!) chicken breasts, I did the math and scaled it down for 1 chicken breast. That should make the math easier for you if you use more than one breast. If you use 2, multiply the ingredients by 2. If you use 3, multiply by 3. You get the idea. The key to deep frying is the hot oil. I used a deep fryer with a built-in thermometer that I set to 375F. However, just because your oil is hot in the beginning doesn’t mean your oil stays that temperature. When you add food, especially cold food, the temperature drops. Keep an eye on the temperature. If it gets too cold, let it heat up again between batches. For the sauce: In a small bowl, whisk together the mayonnaise, mustard, garlic powder, onion powder, vinegar, honey, salt, and pepper until well-blended. Refrigerate while preparing the chicken. Fill a deep fryer or large stockpot with enough oil to submerge the chicken. Heat to 375F. While the oil is heating, place the chicken pieces in a freezer bag. Add flour, sugar, salt, pepper, garlic powder, onion powder, and paprika; seal and shake well. Using a slotted spoon, remove the chicken pieces and shake off any excess flour. Place on a plate or in a bowl. When the oil is ready, place a handful of nuggets into the oil (do not overcrowd your pan! My deep fryer came with a basket and fit roughly 6-8 pieces). Fry for 3-5 minutes, depending on the size of your pieces. You may need to let your oil heat back up to 375F in between batches if it gets too cold (use a thermometer). Place the cooked pieces on a plate lined with paper towels to drain the oil. When the chicken is done, serve with the dipping sauce. 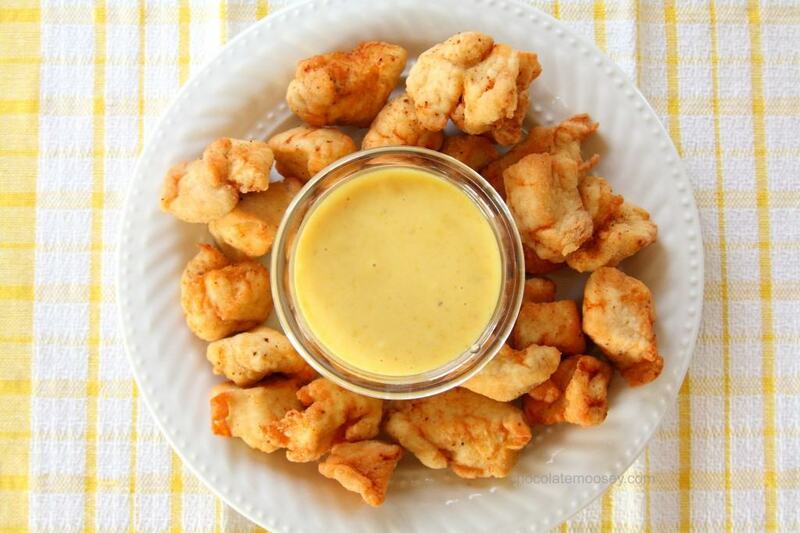 Your nuggets look just perfect, I love copycat type recipes…especially as I did one myself. Mmm I love KFC! When I get a chance, I’ll stop by. Thanks! What? 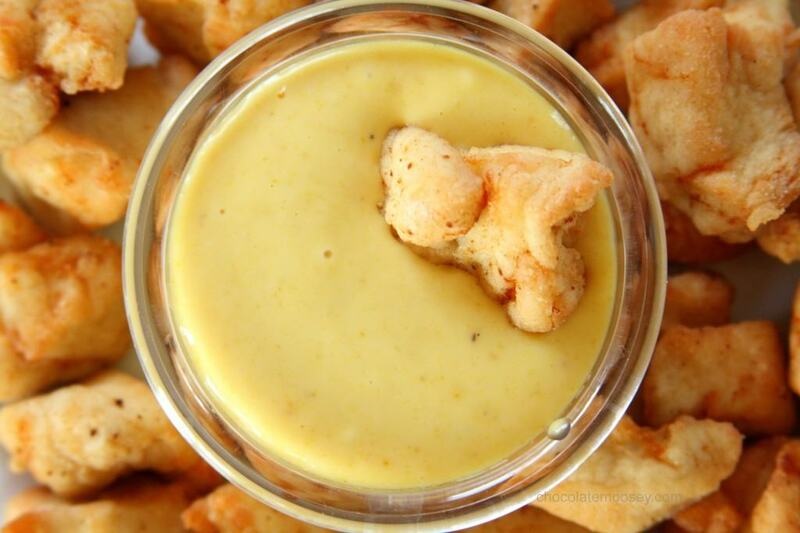 I can make my favorite fast food nuggets at home? Heck yes! I’m in fried chicken heaven. Crazy talk, I know! You can even make them on Sundays ;) Thanks Jennie! I used to love these nuggets. We don’t have Chick-A-Filet around here, so I’m going to absolutely make these at home! Ours is probably 45 minutes. Usually when I am near one, either I forget about it or it’s Sunday. Usually it’s Sunday. Thanks Jen! I’ve never had Chick-fil-a but these look super good & the powdered sugar really makes me want to try them even more! I did NOT need to know the secret ingredient in CFA nuggets is powdered sugar. But the true beauty of CFA? Chicken biscuits for breakfast! Seems like all the good stuff is bad for you, no ;) Thanks! Love love love love love this!! We don’t have Chick-Fil-A in NY! I get it every time I get sent down south for a business trip, but now I feel really guilty eating it because of their political leanings. Instead I can just make it at home! Also, I always found you got the chick-fil-a cravings on Sunday. I think they program it into the chicken on purpose! You’d think with a place like NY there would be one (or ten!). I’ve heard about their political stands, which does make it a little harder to support them. Thanks Susan! OMG. I love chik fila! & these look crazy good! 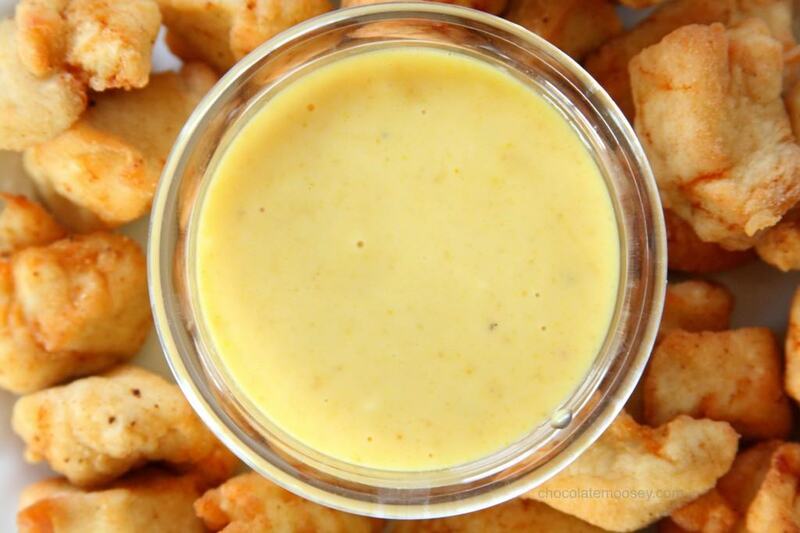 One of my favorite dipping sause is honey mustard! Sounds like you found your next recipe ;) haha Thanks Lynna! Hmm I don’t have peanut oil, so I couldn’t tell you. However, I’d love to experiment with it. I do believe it since peanut oil does make most fried foods better. Thanks Lane! Welcome to the CCC! 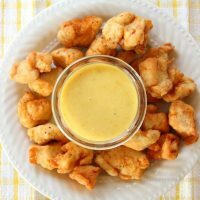 I heart Chick-Fil-A and your recipe looks so tasty! Chick-Fil-A is one of my favorite places. I had their Chick-Fil-A nuggets last night for dinner! These look great! I was thinking of you because you went on your tour awhile ago. Thanks Angie! sounds really delicious. will definitively give it a try. This looks delicious! 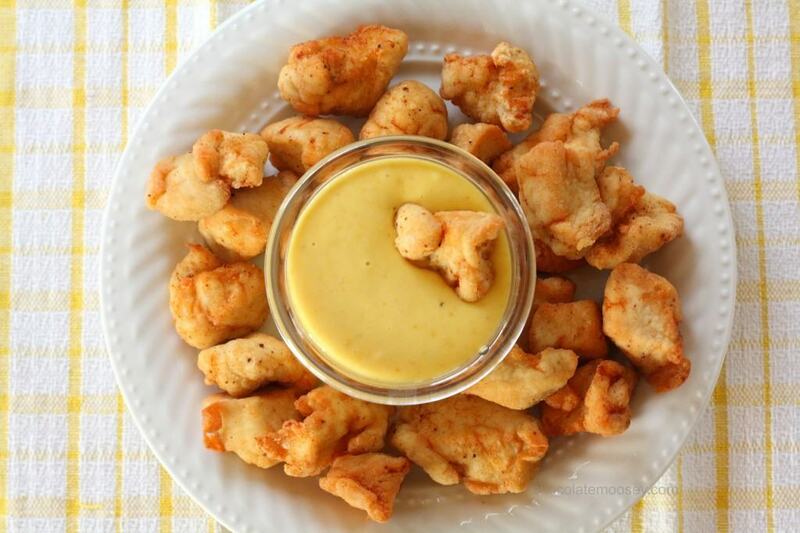 I’ve never been to Chick-Fil-A, but these nuggets look amazing. Great SRC pick! WOAH. I need to try these. There is no Chick-Fil-A around here so I’ll have to do with what I can make in my kitchen! Thanks for sharing! Do you have a giant saucepan, like a dutch oven? You can add oil into there, enough to completely submerge the nuggets when they cook. You will need a thermometer to make sure the oil is at 350F. As for the frying pan, I don’t think it would be deep enough to submerge the nuggets. You can probably pan fry (do one side then flip to the other), but I can’t guarantee the results will be the same. You didn’t reply to the “marinade the chicken in pickle juice” comment above ^? If your electric fry pan or wok is deep enough and can heat the oil hot enough, it could work. As for marinating in pickle juice, I haven’t tried it yet. Let me know if you make it! You left out the essential step of marinating the chicken in pickle juice.